Jack Ryan: Shadow Recruit failed at the box office, and I am hard-pressed to find why. I have never read any of the Tom Clancy novels and haven't seen any Jack Ryan movies save for The Hunt for Red October (or at least remember any save that one), so I don't have much experience in that world. I know of it, but not much. With that in mind, I look at Shadow Recruit like a cross between John Le Carre and Ian Fleming: a blending of the grittiness of a Tinker Tailor Soldier Spy and the action of a From Russia With Love. I doubt that a.) Shadow Recruit will be in either of their leagues and b.) subtitle notwithstanding, there will be more Jack Ryan films (though I hope there will be). However, Shadow Recruit moved well, had good action and strong elements of character development. John Patrick Ryan (Chris Pine) is in London studying economics when September 11th takes place. He enlists in the Marines and is injured, but not before saving his two comrades. While recovering at Walter Reed, he finds an attraction to the medical student Cathy Muller (Keira Knightley). He also meets Commander Thomas Harper (Kevin Costner), who recruits him for the CIA. However, he isn't assigned to be some foreign agent. Instead, Ryan is to use his vast intellect and economics background to work for Wall Street firms and track down the moneys used for terrorism. The CIA even helps finance his studies, and 'ten years later' Ryan has achieved his doctorate (hence, Dr. Ryan). Dr. Ryan has in this time also managed to successfully woo the now-Dr. Muller, and they live together and are somewhere in the engagement world. However, Ryan has to keep his real job a secret from Cathy, who is suspicious when she finds a movie ticket in his pocket, suspecting him of having an affair. While working at his newest firm he comes across highly suspicious accounts from a Russian oligarch, Viktor Cherevin (director Kenneth Branagh). He is plotting a one-two punch against America: a terrorist attack and then an economic strike that would cause a Second Great Depression (and strengthen Russia militarily and financially as well), all with the silent support of the Interior Minister (Mikhail Baryshnikov in a cameo). Ryan, ostensibly sent to conduct an audit of Cherevin's company (which works with Ryan's firm) discovers this plot and is thrown into danger, starting with an assassination attempt on him when he arrives in Moscow. With Harper's limited help, Ryan now must use both his smarts and his fighting skills to find the truth and stop Cherevin's scheme. Things are complicated when an unwitting Cathy shows up in Moscow to surprise him, and Ryan is forced to not only reveal his true work but now gets her mixed up in this dangerous game. It all culminates in New York, where Ryan and Harper race to stop the attack from happening. Adam Cozad and David Koepp use the Clancy characters to create that feared 'origin' story, which makes sense given that Harrison Ford took Jack Ryan to a whole new level and that the first stab at rebooting the franchise (The Sum of All Fears with Ben Affleck as Ryan) failed. What I enjoyed about Shadow Recruit is that we were allowed to see that Ryan is not a superspy/master assassin like a James Bond or Jason Bourne. Instead, he is more an intellect, one who specializes in numbers. When he has to kill the first time as part of his CIA work, there is a mixture of terror and pain at having to take a life. Pine plays this cross of fear, confusion, and determination beautifully. Whether chasing Cherevin to rescue Cathy or when he is terrified about what to do after having killed the hitman sent against him, Pine almost never misses a beat. I have not been particularly convinced that Chris Pine was a particularly good actor (Star Trek notwithstanding), but I find that he has grown on me, particularly with Shadow Recruit. He is able to do the action scenes well, and sometimes he doesn't quite convince in his romantic scenes (when Jack and Cathy have a fight before having to go to dinner with Cherevin as a diversionary tactic it does come across as slightly forced). However, minus that Pine does a strong job throughout the film. I similarly have not been a fan of Knightley, feeling her forte has been in costume pictures (much like her Pirates of the Caribbean co-star Orlando Bloom). However, I thought she did her best work in some time given the limitations of her part. Costner I think would have made a good Jack Ryan himself, but here, he takes on the role of mentor and has a strong and steady presence as Harper, a man who is intelligent in his own right and who is just as capable as Ryan. I also give credit to Branagh for making two smart choices in playing the villain. First, his Russian accent was credible (and the decision to have various conversations take place in Russian and have messages in Cyrillic made Shadow Recruit realistic). Second, he stayed on the right side of camp by not making Cherevin as cartoonish and over-the-top as he could have been. I'm not saying the villain was super-realistic, but he didn't come across as a weak Bond villain in the style of Diamonds Are Forever's Blofeld or more recently, Skyfall's idiotic Silva (whom I always thought was a joker...or Joker). While his presence was brief (two scenes), it is always a joy, a pleasure and a great surprise to see ballet legend/actor Baryshnikov on screen. If anything there was to fault in Shadow Recruit is that it has the unfortunate habit of following so many other action films in making things sometimes hard to see with shaky-cam effect (one of the banes of my cinematic experience). This is unfortunate because the final lengthy action scene where Ryan is working furiously to stop the attack is quite gripping and intense. The chase around Moscow to rescue Cathy is also extremely exciting. However, those are minor points overall. On the whole Jack Ryan: Shadow Recruit is a fine, exciting film, one where the mix of action and intellect make a great spy thriller. In some ways, it is suppose to be the launch of a franchise (we are introduced to the characters and are left with the possibility of more Jack Ryan films). 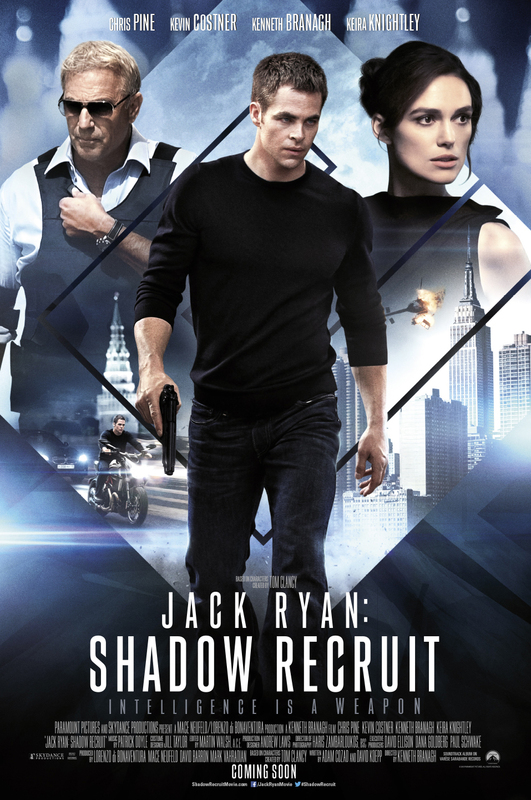 Although Shadow Recruit failed to be a major hit, I for one would love to see more Jack Ryan films or a television series. Jack Ryan: Shadow Recruit may not be the best spy film or even the best Tom Clancy adaptation. It is however, a very good film that meets all the requirements it is asked of: strong action, good performances, engrossing story. Glad to hear you enjoyed the movie, I will have to rent it sometime. I enjoyed the other Jack Ryan movies for the most part (haven't seen the Affleck ones), so I believe I will like the movie. I was surprised at how intense I thought it was, and given some of the negative reviews from others, I really didn't know what they were complaining about.